Stand up to weather with the BannerSaver™ light pole banner bracket! BannerSaver™ brackets allow a banner to flex according to wind speed and direction. 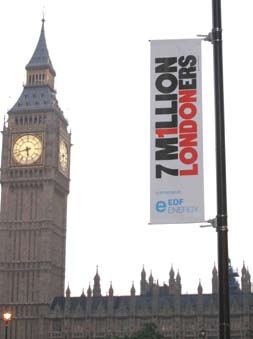 Instead of catching the wind and tearing, your banners bow briefly to let wind spill safely away. When the wind dies down, banners and poles return to their original position, remaining taut and readable the entire time. Simple. Brilliant. Patented. Customers rely on BannerSaver™ to promote events and generate ad revenue on outdoor light poles pretty much everywhere -- from public streets, parking lots and stadiums to golf courses, shopping centers and campuses. Backed by customer support like you've never experienced before! BannerSaver's exclusive spring-loaded mechanism responds to winds quickly according to speed and direction, rotating with the wind vertically and horizontally to dramatically reduce wind load on banners. BannerSaver's change in angle spills 87% of wind compared to less than 25% for standard bracket systems. 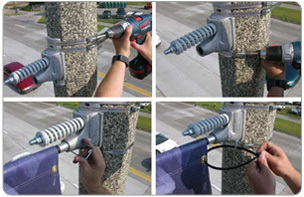 BannerSaver™ is easy to install with standard tools. Powdercoated finish is available. We'll help you select the model you need, depending on your banner size (min. 9 sq. ft. to max. 30 sq. ft.) and wind load. Please note our largest model requires the use of heavy banding and install tool. In addition to BannerSaver™ brackets, you can turn to us for banner design and printing. We provide a turnkey solution that ensures quality and cost-efficiency. Call 800.395.2468 or Contact Us to ORDER TODAY!